While most folks don’t think of PDAs as capable of anything beyond their intended organizer functions, they have, over the past few years, become MUCH more. With a bit of software (most of it free), a Pocket PC can play music, video, and even games with ease and quality comparable to that of dedicated devices. 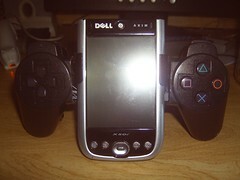 Gaming on the Dell Axim X50v is especially nice. There are a few PDA-exclusive games with graphics and game-play on par with those available for the PSP, as well as emulators capable smoothly running most everything from Atari to the Game Boy Advance. The only downside is that while the internal hardware (CPU, GPU, etc) was designed with gaming in mind, the button layout was not. It’s OK for short bits, but a Wii she ain’t! An external gamepad seemed like the answer, but the only option out there was this folding Bluetooth game pad. I had read that it did work with the Axim (electronically speaking), but that the PDA was too wide for it to actually hook on. Once I got the necessary money together, I got it with the intention of extending it somehow. When it arrived, I did just that–cutting it in half and grafting on the spring-loaded tubes you see on the back of this version. It worked OK, but it was awkward to hold–and isn’t that why I got it in the first place? While not a big console gamer, I am a fan of the way Sony designed their Playstation controllers. With that in mind, I decided to take the innards of the BT gamepad and put them in a modified PS controller. I was extremely lucky in acquiring the controller. I wanted it to be black like the PS2’s, but without the analog sticks. Ebay said there was no such thing, so I was prepared to compromise. When I went to the local GameStop, however, two minutes of searching yielded exactly what I wanted–and for only $3! The wiring was not as easy as I thought. The D-pad was OK with one wire for each button and a common ground, so it wired into the PS controller’s board just fine. No such luck with the action buttons, however. While Sony did it the logical way (like the D-pad), the BT gamepad did not have a common ground. WHY?!?!? Well, a bit of Dremel-ing took care of that and each of the PS’s buttons now had 2 wires. I then wired the PS’s “L2” and “R2” shoulder buttons up to the BT’s “L” and “R”, and the “R1” up to the BT’s “start” (as the PS’s original start button had been removed). Now all it had left to do was attach to the Axim itself. The brackets it the center are cut up pager belt clips that I had laying around. They hug the edge of the Axim like they were made to! The underside is where things get really ratty. As you can see, I made spring cylinders out of two mechanical pencils. The spring itself was pulled from an old battery charger–it fit perfectly in the tube! These cylinders allow the whole thing to stretch, in order to hold the Axim. I’m proud to say that it all worked out quite well, and served to make gaming quite enjoyable! For a time, that is… In an attempt to improve the hot-glue-an-pencil situation, I somehow managed to kill the Bluetooth circuitry (ESD, most likely). I recently finished a much-improved “ver. 2”, and will post it soon. Stay tuned! I was thinking about something simmilar myself. But how did you deal with drivers for the gear?